You might think that the only way you can know whether the grouted cells, bond beams, insulation and other components of a Concrete Masonry Unit (CMU) wall are properly placed, is to open the wall with hammer or drill, where the grout or insulation is supposed to be and see if it is there. There is a method that is accurate, non-destructive and inexpensive. This is the way to see the grouted cells in the entire wall section. 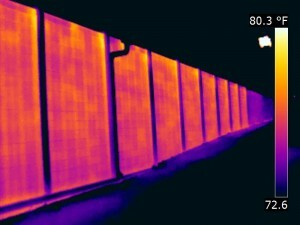 Block Wall infrared inspections can be performed at any time during the construction process without interrupting any other trades or affecting the progress of the rest of the building. However, two benefits arise from having a Block Wall infrared inspection test performed on your newly constructed CMU walls. First, a documented record of the grouted cells and other structural components (in-situ) is created. Secondly, when and if deficiencies are found, a report can be generated so that corrections can be made with surgical precision.